This article is a short summary of Super Mario Bros. 3. 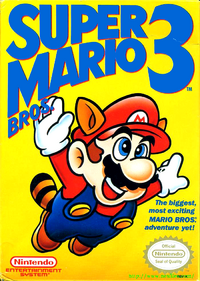 Super Mario Bros. 3 is a platformer video game developed by Nintendo EAD and the last Super Mario Bros. game to be released for the Nintendo Entertainment System. It is the sequel to the Japanese Super Mario Bros. 2 and to the international version. The game was remade on the Super Mario All-Stars compilation for the Super Nintendo Entertainment System and on the Game Boy Advance as Super Mario Advance 4: Super Mario Bros. 3. It was also released for the Wii's Virtual Console in 2007. "Fight monsters and mini-bosses, avoid ghosts and the burning sun. Make your way through water and quicksand. Dodge cannon balls and bullets and rescue the King's wand! In Super Mario Bros. 3 there are more warps, more chances at extra lives, and new special suits! The raccoon suit lets you fly and knock out blocks. The frog suit helps you out-swim deadly fish. There are suits for every occasion! Store up flowers and mushrooms to use later on. Play game-show type bonus-rounds! Go back to that last screen and get a mushroom! Pause to take a break, then continue where you left off! Super Mario Bros. 3 is fun to play alone, or team up with a buddy to prolong the adventure!" Bowser is back, and along with the Koopa kids, he's out to spoil Mario's day once again. This time, along with nabbing the Princess, the Bowser crew have also taken the magic wands from the Kings of each land and turned them into creatures. It's up to Mario and Luigi to get back the magic wands, defeat Bowser, and save the Princess all before the day is done. See Technical details for more information. See Release management for more information. This page was last edited on 28 October 2018, at 19:43.